If you are looking for the latest and greatest in craftsmanship, Mark Kia is the pot of gold at the end of the rainbow. Our sales associates welcome you to a lot full of options guaranteed to match your current lifestyle needs. No matter what car you choose, the financing department is prepared to provide the best financing possible. Our service and parts departments work hard to make sure you're on the road for the long-haul. Through scheduled maintenance and repairs, we reduce car ownership stress and replace it with serenity, no matter what unexpected bumps pop up along the way. 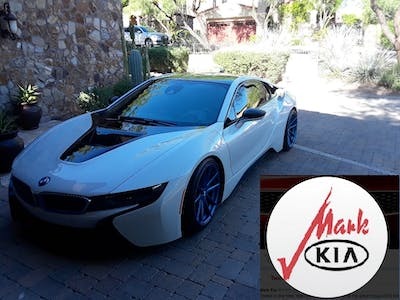 Let Mark Kia help you cover all of your automotive needs. Contact us online, by phone at 480-425-5300 or stop by to see us at 100 N Scottsdale Rd., Scottsdale, AZ, 85257. Proudly serving the greater Phoenix, Tempe, Mesa and Gilbert region. "Great customer service by Isaac Cruz"
Isaac works very professional with me, he answer all my questions and he always been available for any concern. Overall was a good experience the only thing I did’n like was the attitude of Jacob one of the sales managers he has a poor customer service. 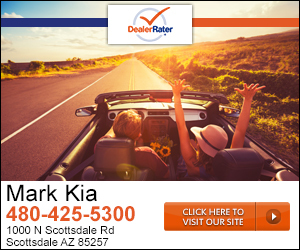 Our experience at Mark Kia exceeded expectations. Our sales person, Ryan McDade was the most polite, accommodating, knowledgeable and attentive. Our Finance Manager, Juan Rodriguez was extremely helpful, patient and knowledgeable. I can’t say enough about how professional and friendly everyone was. Outstanding service by Ryan and Juan and an excellent dealership. Highly recommend and extremely pleased with our experience. Everything was awesome! Very efficient great service! All of staff was very welcoming and attentive. They met all needs and went above and beyond explaining everything. Made buying a car a positive experience. Ryan did an amazing job! Very quick, friendly service. It will be be great when they move to the new dealership location. They have grown out of the current one. "Difficult Deal With Happy Ending"
I had a super complicated deal to work thru. Kevin really camel thru from soup to nuts. Did a great job at following up with me on any questions or concerns I had. Proud owner of a new Stinger! "Bought a tesla model 3"
Thank you Ryan for coming to my job for me to fill out the remaining forms. I really appreciate it! Overall, a great experience! Thanks! Jose Cruz is a very helpful amazing man, he went beyond his job duties to help me find the perfect car for my family, very respectful and helpful man. I highly recommend Jose Cruz, even after my car purchase he kept in contact to see it I have any questions about the car. 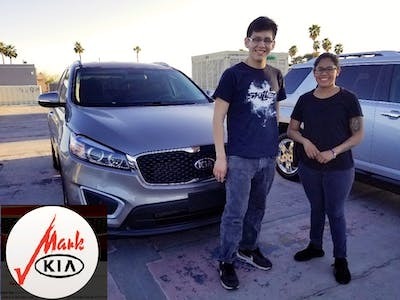 I'll definitely recommend my friends to go purchase a vehicle at Kia mark! 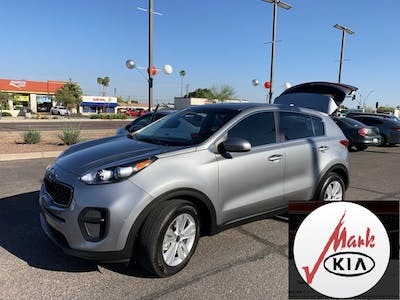 "Traveled over 400 miles to buy a car"
We wanted to replace our 6 yr old Kia Soul with a new Soul, and since the 2020 was just out, the 2 Kia dealers did not have the model (EX) we wanted without special ordering it. I went online and contacted Mark Kia. The internet salesman (Jason) contacted me, we discussed a deal with our 2013 trade-in, sent pics of the 2013 to him, and he made an offer. Even though his offer for the trade-in was a little lower than a local dealer had made, he found the model and color we wanted in town, said he'd bring it in, and made us an offer. The local dealer's offer to order one was about $1000 higher than Mark Kia's offer. 2 days later, we drove to Scottsdale, signed the papers, and the next morning we drove our new Soul home. The price was as negotiated, and delivery of the vehicle was on time. I'm in love with the car! I left Mark Kia a happy woman!!! And I got a really good deal I would go back over there over and over! "Probably the worst experience I've ever had-Reality Show Bad"
It's almost comical how incompetent and careless everyone who I interacted with at Mark Kia....and even though I bought a car from them 3 months ago, I'm still paying for it. Here's a accurate list of everything that happened: 1. When I purchased the car, they had the wrong name and address for the title. Luckily I caught it, but the finance guy brushed it off like no big deal. 2. I asked for my loan to go through TruWest, the finance guy did it through Vantage West. 3. I had a small maintenance issue on the car take 8 days. They said they were waiting on a part that can be purchased anywhere in the valley and could have been fixed in one day. 4. The finance team underpaid on my trade in, causing me to be sent to collections by Kia Finance. Been calling and leaving messages for 4 days and nobody at Kia has called back. I keep calling. They keep not responding. It's a clown show over there.